Our team has a proven track record in delivering highly technical products for the space and defence industries (where fuel cell and solar cell technologies were originally developed) and have worked with BAE Systems, Marconi, Astrium, SEA(Group) and Thales. The Auriga Energy team has over 20 years of combined experience in developing and manufacturing fuel cell systems, and are committed to accelerating the adoption of hydrogen fuel cells throughout the world. Our highly skilled team enjoys unrivaled experience in the development of highly efficient hydrogen fuel cell systems, and is regularly asked to comment on advances in this key area of energy production and present at industry conferences, forums and conventions. 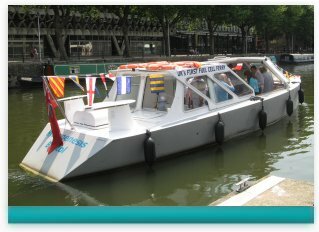 Our experience of leading the consortium to develop the UK’s first fuel cell ferry, the Hydrogenesis, in Bristol, – powered by an Auriga Energy fuel cell system – has enabled us to demonstrate the commercial viability of our systems delivering tangible benefits to end users and the environment.